ELLIOT COOPER is making his television debut in the second series of medical conspiracy thriller Trust Me. Set in a Glasgow hospital, Trust Me follows the story of Corporal Jamie McCain (Alfred Enoch), who is recovering from a spinal injury which has left him paralysed. He faces a new enemy as patients on the ward die unexpectedly around him. 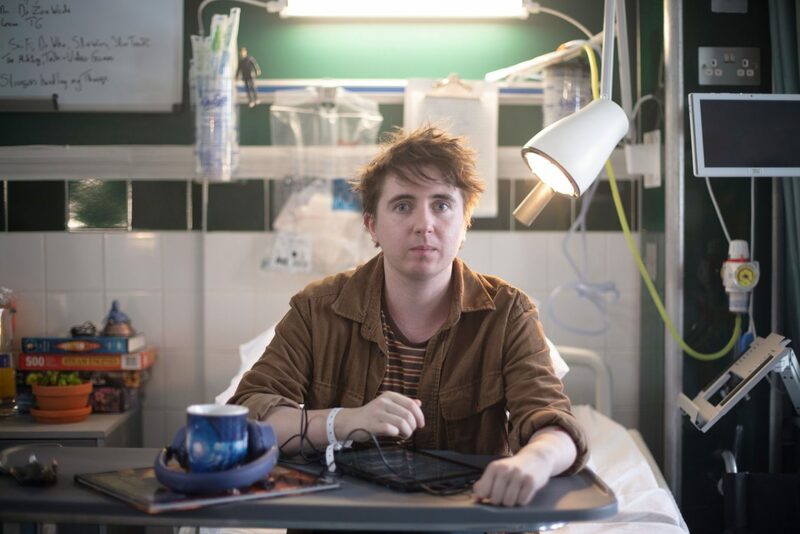 Elliot Cooper plays Danny, a fellow spinal injury patient whose mind fizzes at a hundred miles a minute with technology stats, conspiracy theories and an obsessive love of Doctor Who. When Jamie arrives on the unit, Danny self-appoints himself as his ‘best mate’. AC: How would you describe Danny’s relationship with the central character? ELLIOT COOPER: Jamie was a figure of authority. Danny would be aware, due to his interest in military history, that Jamie is almost guaranteed by the nature of his service to be trustworthy and capable, so sharing the information with him would be a good idea as it would allow that information to be communicated from a trusted source. Secondly, Danny saw that Jamie had no visitors, no interaction outside and was fairly shut down to the staff – it strikes me that Danny is someone who has spent time alone, isolated and knows how that feels. 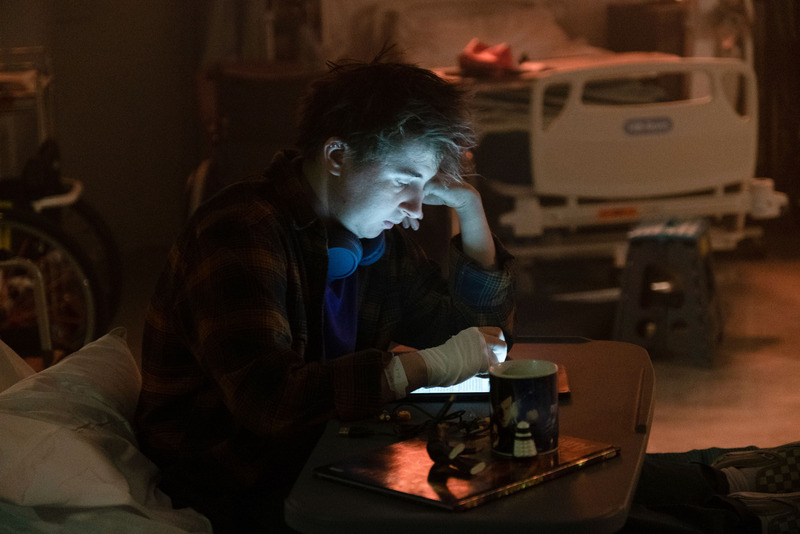 Perhaps he didn’t want Jamie to feel the same things he had previously felt regarding social isolation, so took it upon himself to intervene and try to be his friend – the way Danny knows how to do this. Information exchange. Did you do research in preparation for the role? I read a lot about SCI (Spinal Cord Injury). I don’t have an SCI personally, although I do have spinal lesions, so getting my head around the traumatic incident and how that would impact how a person viewed their physicality was difficult, not only was a traumatic incident not my experience of my impairment, a quick ‘oh now you’re disabled’ turnaround was so far from how I have learnt, and am learning to understand my body and experience. I read a lot of testimonials, talked to people I know who have had an SCI and tried to understand how that would change your interaction, conceptually, with your body and your disability. I read around Danny’s interests as much as possible to understand his mechanisms and lenses for viewing the world and tried to figure out how he would think. Danny is younger than me, so I read a lot of sources from younger people online and tried to empathise with them, and think back to how I thought when I was younger than I am now. I tried to embody the physicality a little bit. I do not have an injury at T (thoracic) so can only really approach the physicality from a position of mimicry. I discussed, at length, what it was like having an injury at ‘T’ with people with an SCI that I knew, and tried to figure out how to translate my own incomplete lesion at ‘C’ (cervical) to looking like an ‘T’. This had, varying levels of success but, trying to reconsider my physicality on such a specific level as ‘incomplete T might be able to move their legs differently, complete T might also…’ and generally learning more about the variance in how SCIs present not only felt like something Danny might do (intensely researching his own condition, as many people do) but also felt like something that broadened my own understanding not just of Danny, but of SCI in general. Where do you think Danny’s interest in conspiracy theories stems from? Either he had noted some odd behaviour and decided to research the hospital in greater depth, or during a ‘routine’ research of the hospital, he may have noted the abnormality in the morality rate and thought it prudent to investigate and try and come up with a conclusion as to why this was happening. It started out of curiosity, rather than necessarily going in with a theory already built. Once the data was assembled and he could see the differences in mortality between the unit and other similar units, then he would probably have begun hypothesising. Danny is well versed in conspiracy theories, and an upshot of that type of thinking is a critical eye towards data and behaviour. Your character has an obsession love of Doctor Who, are you a fan? Doctor Who is a show that I have been watching since I was very young. I’m not at the level of Doctor Who fan that Danny is by any measure, but when I was a young teen I could have measured somewhere similar. I did spend a lot of time learning about Gallifreyian traditions, and I’m pretty sure that suggests a level of fandom that is maybe outside of the average. I keep up with Doctor Who now for sure, but not quite with such an intense focus as Danny, or me as a young teen, had. How does your character fit into the wider story? Danny observes. I like to think of him as equivalent to someone in a watchtower, notating information and communicating it to other people. He observes and comes up with theories that he then communicates. In the Spinal Unit, he is a patient who is close to his discharge date, and from my own knowledge of hospital settings this would make him fairly well known amongst the staff, he’s just about to regain his independence and perhaps as part of that is learning to put together information he sees into a workable frame for his interactions. There are elements to Trust Me which almost lean into horror. What is the show to you? It does almost lean into horror yeah, there are defintiely bits that would characterise as more inkeeping with horror conventions than the normative murder mystery conventions. In terms of genre, I would put the show closer to psychological thriller than murder mystery, as what seems to be important is the actions of characters, the ‘how’ of the way things are done as opposed to a potentially more linear detective drama in which interactions serve only as clues. This show seems to examine more of the inner workings of understanding, and the paranoia of being in a place that is potentially unsafe. With the dark subject matter, what was the atmosphere like on-set? Working on set was really interesting, though a bit dissociative for me for the first week or so. Prior to this, the only sets I had been on had been in Youth Theatre and in Contemporary Performance Art. I expected it to look like a set, but when I rolled in it didn’t look like a set – it looked like a hospital! I’ve spent a lot of time in hospitals, and I had expected to be able to discern the differences straight away, but when there, I found myself feeling the same things and engaging in the same manner as I would do within a medical context. I came to really enjoy the contrast between this seemingly medicalised place, and interactions with the actors and crew. Every day brought something new and when it did come time to leave, I found myself missing it. Aside from Trust Me, where else will we see you in the near future? Honestly, I don’t know. I would love to continue working in the creative industries and finding ways in which to express my interests in a way that is accessible to potentially a large amount of people. Telling stories and expressing narrative can take many forms, and I guess that acting is a form that I have found myself interested in. I hope to have other opportunities within the creative industries following this.